Centrally located in Western Oregon, the City of Eugene is situated in the state’s lush Willamette Valley. Eugene is served by a small but friendly regional airport with flights to and from most major west coast cities. The north-south highway, U.S. Interstate 5, runs from the Canadian border to the Mexican border and right through Eugene. 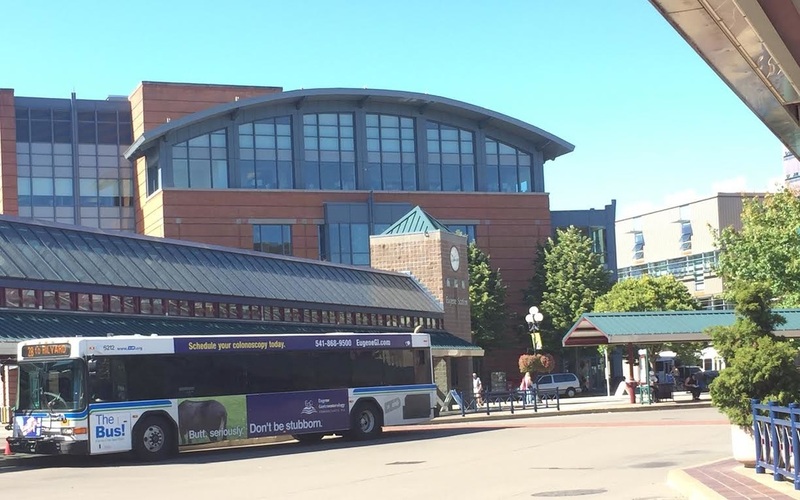 The Amtrak train and Greyhound bus systems also serve the city of Eugene. Keep in mind it is illegal to pump your own gas at Oregon gas stations. From the Eugene Airport: Follow Highway 99 to the Beltline Highway. Take Beltline East to I-5 South. From Interstate 5 South, take exit 194B in Eugene. Take Exit 2, the Coburg Road exit ramp; keep left at the fork in the ramp and follow the signs to UO. Go straight onto southbound Coburg Road, which crosses the Ferry Street Bridge. Stay in the left lane on the bridge, exiting onto Broadway, which becomes Franklin Boulevard. Follow Franklin Boulevard to Agate Street. Turn right onto Agate and left onto 13th Avenue. From Portland and the north: From Interstate 5 South, take exit 194B in Eugene. Take Exit 2, the Coburg Road exit ramp; keep left at the fork in the ramp and follow the signs to UO. Go straight onto southbound Coburg Road, which crosses the Ferry Street Bridge. Stay in the left lane on the bridge, exiting onto Broadway, which becomes Franklin Boulevard. Follow Franklin Boulevard to Agate Street. Turn right onto Agate and left onto 13th Avenue. 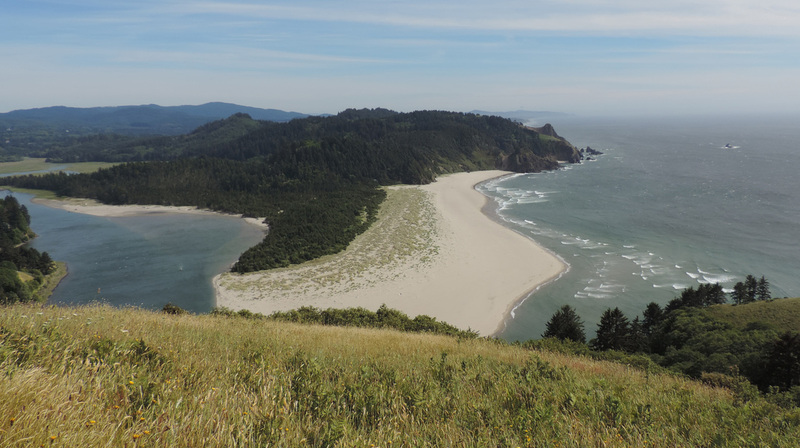 From the Oregon Coast: Take Highway 126 East until it becomes West 11th Avenue. Follow West 11th Avenue to Garfield Street and turn left. Take Garfield to Seventh Avenue and turn right. Get in the right lane and follow 7th Avenue until it becomes Franklin Boulevard. Get in the right lane and follow Franklin Boulevard to Agate Street. Turn right onto Agate and left onto 13th Avenue. From Bend and the east: Take Highway 126 West through Springfield and on into Eugene. Take Exit 2, the Coburg Road exit ramp; keep left at the fork in the ramp and follow the signs to UO. Go straight onto southbound Coburg Road, which crosses the Ferry Street Bridge. Stay in the left lane on the bridge, exiting onto Broadway, which becomes Franklin Boulevard. Follow Franklin Boulevard to Agate Street. Turn right onto Agate and left onto 13th Avenue. 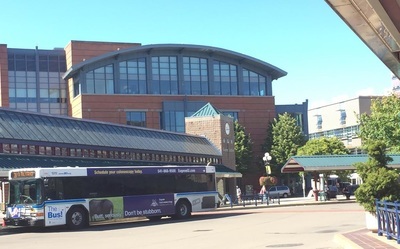 The Eugene Airport (EUG), conveniently located approximately 10 miles (16 km) from the UO campus, has flights by Alaska Airlines, Allegiant Air, American Airlines, Delta Air Lines, and United Airlines. There are direct flights from most major west coast cities including: Denver, Honolulu, Los Angeles, Portland, Salt Lake City, San Francisco, and Seattle. For your convenience we recommend you fly directly into Eugene. However, some SSHL participants may choose to fly into the Portland International Airport (PDX). The Portland airport is approximately 100 miles (160 km) from Eugene. 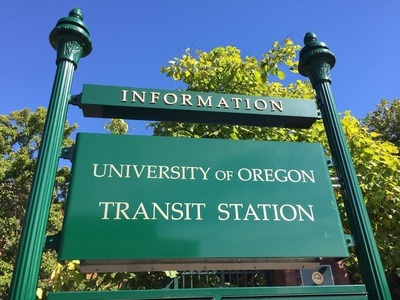 To get from PDX to Eugene you can rent a car or take the Hut Shuttle or City2City Shuttle. Once you’ve arrived, you’ll likely need a campus map to help you get around the UO. Download here. All three days of events for the Symposium have been conveniently scheduled to take place in the two blocks between East 13th and East 15th Avenues between the streets of Agate and Villard. You can highlight on your map the Ford Alumni Ballroom (for Thursdays activities) and the Bean Complex and Global Scholars Hall - across from each other on East 15th Avenue - for Friday and Saturday.